I’m not a big “no-global” proponent; so if someone in, say, Vermont, is making great ice cream, I think it should be shared with the rest of the world. Therefore, when Ben & Jerry’s (full disclosure: I have eaten hundreds of pints of B&J’s in my lifetime) was scheduled to open a store in Florence that wasn’t a major issue for me. But when that storefront is just a few feet from the façade of the Duomo and my favorite flavors (Vanilla Heath Bar Crunch and Triple Caramel Chunk,) of the Vermont ice cream have turned in to a frozen substance made by Unilever in Holland, renamed Caramel Chew Chew and Vanilla Toffee Crunch (because evidently there are no Heath Bars in Europe), then I’m just a little bit burnt to a crisp under this Tuscan sun. 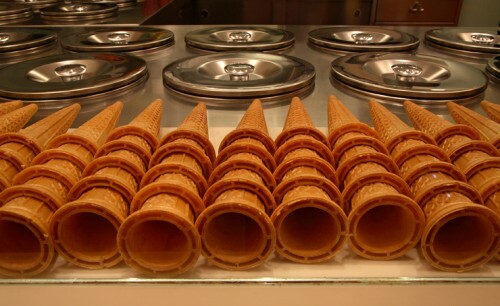 Ice cream is an important part of the American culture, but here in Italy, it is a religion. 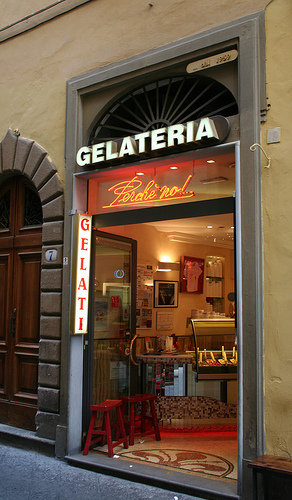 On a weekly basis more Italians enter a gelateria than a church. They argue about gelato more than religion, too. Florentines, especially, can debate long and hard about their favorite gelateria: describing the benefits of local gelato-masters vs. the new “foreigners” (from Turin or Bologna or Sicily); asserting that creamy cioccolato fondente is better than cioccolato extra noir that lacks both eggs and cream; and despairing that not only do foreigners commit the sins of eating semifreddo in the summer, granita in the winter, but the tourists also request a 5 euro cone (way too big) from any so-called gelato stand that stacks the factory-made blocks of ice cream, sculpts them into a hill, and drapes fruit all over the mountainous mass. ‘Gelato’ means ‘partially frozen’ or “icy” in Italian and the various kinds of ice cream served throughout the country are all known by that name. 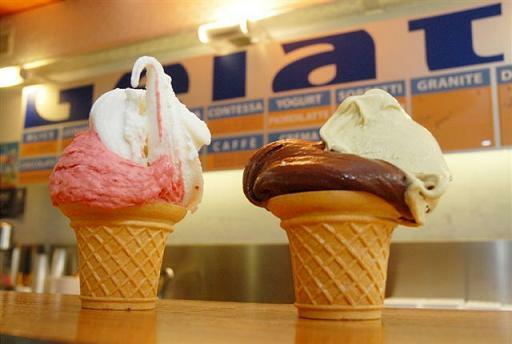 You can order gelato in any little town, in any region and basically know what you will get. 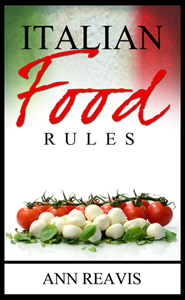 But it is important to keep in mind that Italy has only been a unified country for 150 years, so each of the former city states is justifiably proud of its own recipe: in the mountainous North, where it’s cooler, the gelato is thicker and creamier, often made with cream and egg yolks – chocolate, zabaione, and hazelnuts prevail. In the South, the gelato tends to be lighter, using milk as well as and fruits, such as Sorrento lemons, and nuts, like Sicilian pistacchios from Bronte. Florentines have had a 500-year love affair with gelato. 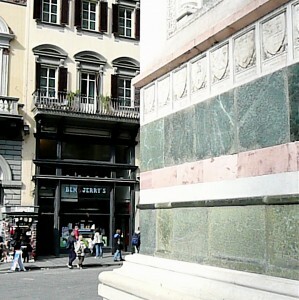 Bernardo Buontalenti – architect, engineer and theatrical set designer – supposedly invented churned-over-ice, milk-based gelato for the court of Francesco de’ Medici to impress a visiting Spanish delegation in 1565. Today, there is a rich creamy gelato that bears Buontalenti’s name. But getting back to Ben & Jerry’s … it’s one of America’s premium ice creams. If gelato is Italian ice cream, what is the difference? First of all, there is the percentage of butterfat. B&J’s clocks in at around 17%, whereas most Italian gelato averages 5% to 9%. Also, handcrafted gelato is served same-day fresh so binders and preservatives aren’t necessary. semifreddo – means “half cold” and is made from the same base as gelato, but has whipped cream folded in to create a frozen mousse. sorbetto – is a sorbet, usually made with any kind of fruit, but chocolate and caffé flavors are making a strong showing, as well as herb-infused (basil, rosemary, etc.) offerings. Great as a palate cleanser between courses in an extended multi-course meal. granita – shaved ice, made with water, sugar and fruit flavors – strawberry and lemon are favorites – or coffee (great with a dab of whipped cream), mint or almonds. Served in a plastic cup or glass, but also on brioche in Sicily in the summertime. 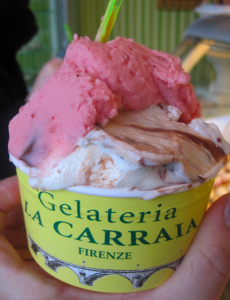 Carabé – Via Ricasoli 60r – Sicilian owners, delicious fruit and nut flavors (ingredients brought from Sicily), best granita. 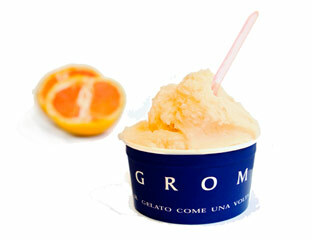 Try: Cassata Gelato, Lemon and Raspberry Granita together, and Coffee Granita with whipped cream. 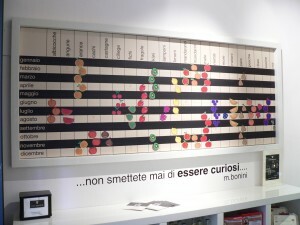 Carapina – Via Lambertesca 118r – young Florentine owner, trendiest, posts a calendar of ripe fruit and only makes those flavors when they are at their peak. Try: Menta (mint), Ciliegia (cherry), and Chocolate with ginger. Vestri – Borgo degli Albizi 11r – superb chocolate shop with the best chocolate gelato and incredible thick hot chocolate (served cold in the summer) – mix the two for affogato (gelato drowned in chocolate). Try: Affogato with Chocolate, Pistacchio or Vanilla gelato. Those visiting Florence at the end of May are in for a treat. 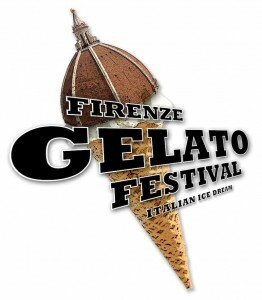 The First Annual Firenze Gelato Festival will turn Piazza S. Annuziata into a giant gelateria where artisans of the handcrafted gelato will compete for the hearts and taste buds of Florentines and foreigners from May 28 to 31, 2010.